Calling W6RMQ . . .
We lost Dad (aka my father-in-law, Welner “Bing” Tully) three years ago today. He had been in hospital for about a week after his heart and kidneys failed, and he was on his way home when he died in the ambulance as it left O’Connor Hospital. 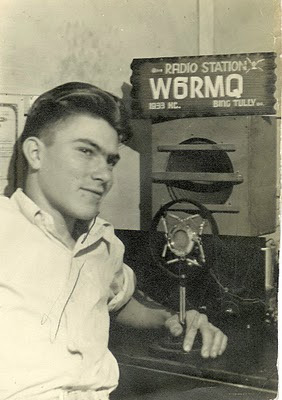 Dad was a ham radio buff from an early age – think of ham radio as his generation’s version of Facebook or Blogger — and instead of “friends,” “fans,” or “followers,” he collected calling cards — colorful postcards with the call signs, names, and cities of his fellow radio operators. Here he is at his homemade radio station at his Aunt Amelia Binning’s home on South Grande Vista in East Los Angeles, sometime in the mid-to-late 1930’s. Incidentally, I think this is the only picture we have of him with “long” hair – after serving in the United States Army during World War II (as a radio operator in the Pacific Theater), he wore it “high and tight” for the rest of his life. He used to say he saved money on combs that way! I wonder if he has a radio station up there in Heaven, so we could tell him how much we miss him but how his spirit lives on through his family and those who loved him. Caliling W6RMQ…Bing Tully, do you read me?